The actor Paul Bildt belonged to the pioneers of the German film history and appeared in more than 100 feature films in his long-standing career. His first movies came already in 1910 into being and were called "Gräfin Ankarström" (10), "Rehabilitiert" (10) and "Schuld und Sühne" (11). In the next years he took part in movies like "Zu Tode gehetzt" (12), "Die Landstrasse" (13), "Mr. Wu" (18), "Rose Bernd" (19) and "Nachtgestalten" (19). 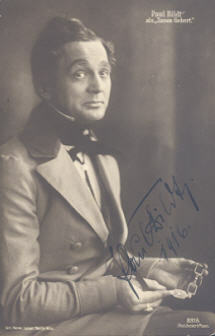 Paul Bildt was more and more brought into play as an actor in the 20's. To the most important movies of this time belong "Schloss Vogelöd" (21), "Lady Hamilton" (21), "Friedrich Schiller" (23), "Die Verrufenen" (25) and "Menschen untereinander" (26). His height as an actor he had in the 30's. He appeared in many talkies and became a steady institution who was able to convince in countless support roles. To his most popular movies of the 30's belong "Der Andere" (30), "Dreyfus" (31), "Viktoria" (35), "Friedericus" (36), "Glückskinder" (36), "Der Herrscher" (37), "Der Mann, der Sherlock Holmes war" (37), "La Habanera" (37) and "Der Berg ruft!" (38). He also worked without interrupt for the German film in the 40's and 50's. He entertained the audience with his appearings in "Das Mädchen von Fanö" (40) with the harmonic pairing Joachim Gottschalk and Brigitte Horney, "Kora Terry" (40), "Kolberg" (45), "Affäre Blum" (48), "Unser täglich Brot" (50), "Toxi" (52), "Die Spur führt nach Berlin" (52), "Sauerbruch - das war mein Leben" (54), "Ludwig II" (54) and "Der 20. Juli" (55).